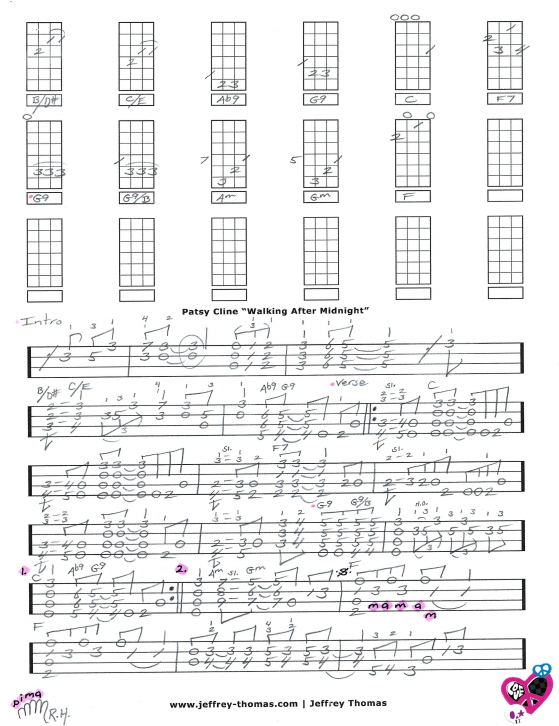 Patsy Cline Walking After Midnight free ukulele tab by Jeffrey Thomas. Learn to play this country classic with my accurate arrangement that is perfect for vocal accompaniment or solo playing. I staying in the original key and followed as many of the signature licks as possible. My ukulele students are requesting cool songs every week! Want the full ukulele tab for free? Just send in your email address using the form provided. Looking for the best online ukulele lessons? Fill out the Schedule A Free Lesson form to set up your free Skype ukulele lesson today. “Walking After Midnight” became Cline’s first major single reaching number 2 on the Billboard Country Music chart. Make sure to browse my online ukulele tab, video and blog pages for more free online ukulele lessons.